Looking very much like malanga, this potato-like root can range in length from 1 to 2 feet. The flesh is often creamy white and pink. 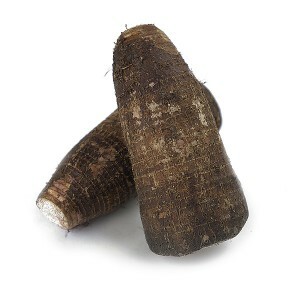 Taro Root, though not very flavorful raw, has a nutty flavor when cooked and is very easy to digest. Used much like a potato, Taro Root can be boiled, fried, or baked, while the edible leaves may be steamed and used just like spinach. Names: Malanga Coco, Big Taro.